Greetings everyone! Over the last few weeks the weather at Frost Valley has been getting warmer and warmer. Some green leaves have started growing on the trees and there are flowers blooming right and left. This is so exciting and means that summer is right around the corner! It also means that we all need to start paying more attention to staying hydrated. Don’t let the Catskills fool you- though our summer nights are cool and breezy, our days are often hot and humid! Throughout the summer we like to make sure everyone is staying hydrated and cool, especially our campers. 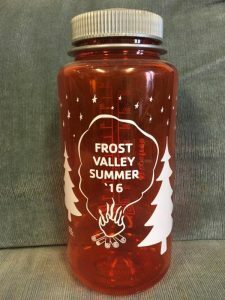 Our amazing staff pull out all the stops to make this happen- from water chugging contests to homemade slip n’ slides, Frost Valley likes to make water and hydration an automatic part of every camp day.